Five Kansas State University students have been awarded National Bio and Agro-defense Facility Scientist Training Program fellowships funded by the U.S. Department of Agriculture’s Animal and Plant Health Inspection Service. The fellowship recipients, from left: Kaitlynn Bradshaw, Laura Constance, Chester McDowell, Victoria Ayers, and Christian Cook. 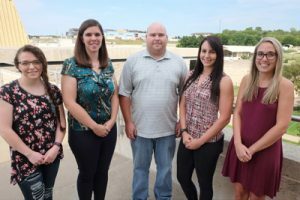 Five graduate students from the Kansas State University College of Veterinary Medicine have been awarded National Bio and Agro-defense Facility Scientist Training Program fellowships. The awardees will receive tuition, stipends, and funds for supplies and travel from a five-year, $1.6 million grant from the U.S. Department of Agriculture’s Animal and Plant Health Inspection Service (USDA APHIS). The students were selected for their interest and expertise in emerging animal diseases, diseases that infect both animals and people, or foreign animal diseases that threaten global health and food security. Once they complete the fellowship program, they are committed to working at the Foreign Animal Disease Diagnostic Laboratory at the Plum Island Animal Disease Center in New York and, ultimately, the National Bio and Agro-defense Facility (NBAF), which is under construction adjacent to the university’s Manhattan campus. The selected students already have received training in high-containment facilities that work with pathogens that will be studied at NBAF. The fellowship recipients, who will be mentored by professors with whom they have worked with for at least one to three years, are Kaitlynn Bradshaw, a master’s student in veterinary biomedical science; Chester McDowell, a concurrent doctor of veterinary medicine and doctoral student in diagnostic medicine and pathobiology; Laura Constance, a concurrent doctor of veterinary medicine and doctoral student in diagnostic medicine and pathobiology; Victoria Ayers, a doctoral student in diagnostic medicine and pathobiology; Christian Cook, a doctoral student in diagnostic medicine and pathobiology. The fellowships include a five-year $50,000 stipend for the concurrent doctor of veterinary medicine and doctoral students; doctoral students receive a four-year $50,000 stipend; and master’s students receive a three-year $35,000 stipend. All students also receive health benefits and funds for materials, supplies, travel, publication costs to further their research.